Pretty much half the news media is backpedaling from their coverage of footage of white Covington Catholic High School students in MAGA hats taunting and harassing a Native American elder, Nathan Phillips, on the steps of the Lincoln Memorial in DC amid the Indigenous Peoples’ March earlier this month. Footage of the incident went viral online, and numerous high-profile publications covered the incident, but after a sustained pushback from conservatives, Team Respectability Politics is now insisting maybe they were too tough on the teens. According to HuffPost, the House Intelligence Committee—which, by the way, is now controlled by Democrats—as well as Democratic Senator Mark Warner of the Senate Select Committee on Intelligence have requested Twitter provide more information about how and why the video went viral. The news follows a CNN Business report earlier in the day that found an apparently disingenuous account using the handle @2020fight posted a version of the clip that racked up millions of views on Twitter. Another report in the Washington Post on Tuesday offered lots of quotes on “media manipulation,” but little hard evidence beyond two other viral tweets from seemingly suspicious accounts. OK, so let’s back up for a second. First of all, the account seems to have many of the hallmarks of a fake, such as using another person’s photo, offering paid shoutouts, and tweeting more than any sane person would. This is pretty clear. But there’s nothing yet to indicate it has anything to do with, say, that goddamn Russian troll factory. It could be U.S.-based social media marketers that bit off a lot more than they could chew. 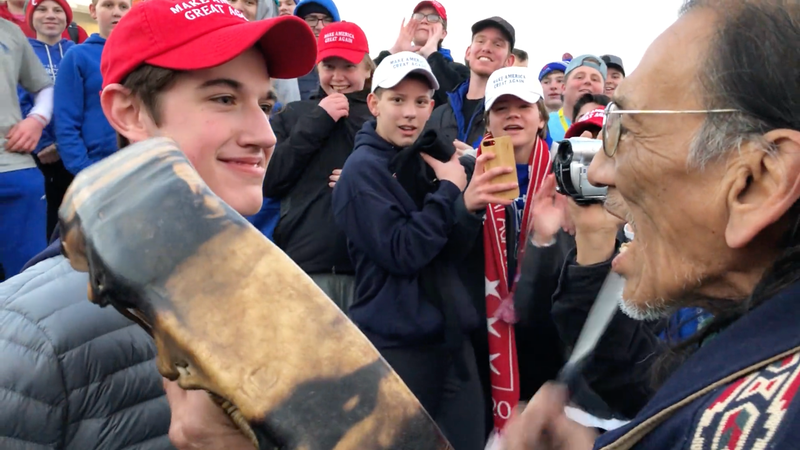 However, one might also point out that this was a bunch of teens in MAGA hats harassing a Native elder—odds are pretty good that it was bound to go viral anyhow. Media of the incident was everywhere on the internet, not to mention television and print, and would have been trivial to obtain elsewhere. As our sister site Deadspin noted, though subsequent videos from other angles added almost no new significant context to the scene beyond the presence of apparent Black Hebrew Israelites throwing their own taunts, the ready-made controversy was relentlessly covered by the right-wing media. In any case, while the video itself depicted something awful (and materially real), the hazy circumstances by which it spread are rapidly becoming a major talking point for both above-the-fray types and conservatives. So it goes, apparently. Gizmodo has reached out to Twitter for comment on this story, and we’ll update if we hear back.